Fall Fest is Tonight! We are so excited to celebrate with our school community! 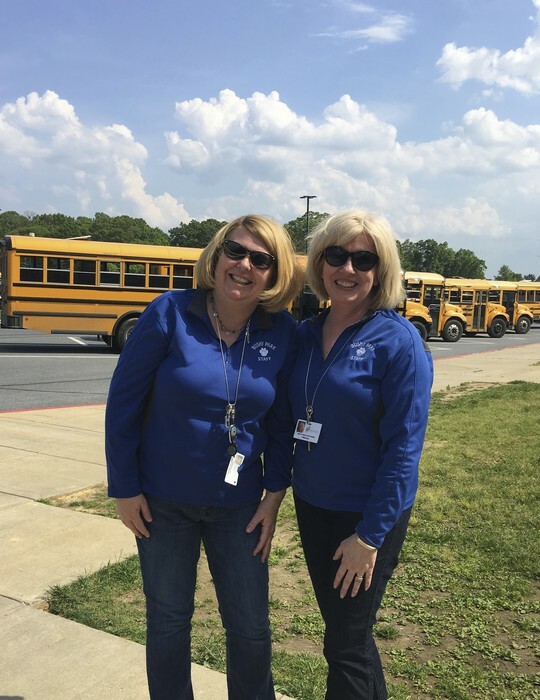 Thank you to, our PTA Chairperson, Beth Lioi for her communication and organization to bring this event to life! Thank you to the dozens of volunteers giving their time to serve and to parents for giving of your family time to participate with your children! Interim Reports were sent home yesterday on Thursday, October 12th. It represents the shortest time period for interim reports due to our later start this year. Our students continue to progress and grow academically, socially and emotionally. We are so proud of their efforts and grateful for your partnership! Having our Back-to-School gatherings before the school year began was a change in the way we have met together in past years. We have asked for your feedback to help us reflect on the timing and communication for our events for next year. Thank you for taking your time to offer your voice, the link is above. 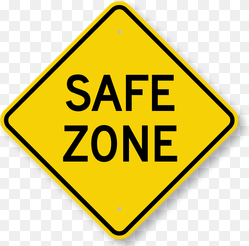 We will also be sending the link out via HCPSS Messenger in order to provide an additional venue to respond. 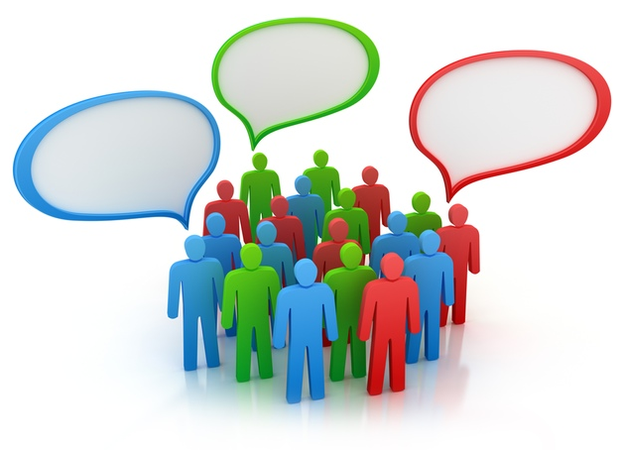 So far we have received 31responses and wish to increase that amount of responses. Thank you for your consideration! CONGRATULATIONS to Elise Donald, Jason Liang, Sae-Young Um and Nina Xie!!! These four talented and brave fifth grade Strings students dressed and auditioned recently for a special Elementary GT Orchestra program in Howard County. 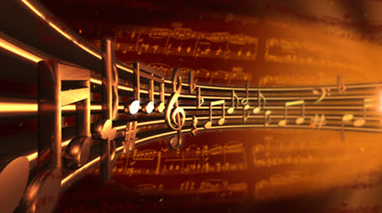 It is a very rigorous program and a challenging audition! We can be very proud of each and every one of them! We found out the good news that Jason was accepted into the program! This is Jason's second year in the Sinfonia Orchestra. Way to go! Please join me in congratulating Jason on this accomplishment, as well as Elise, Sae-Young and Nina for their hard work and dedication to improving their craft by practicing such challenging music! We are excited to celebrate Halloween together on Tuesday, October 31st. 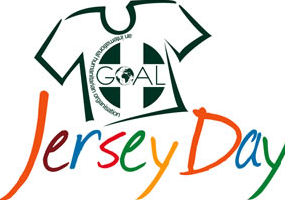 We have information to share with you regarding the day. 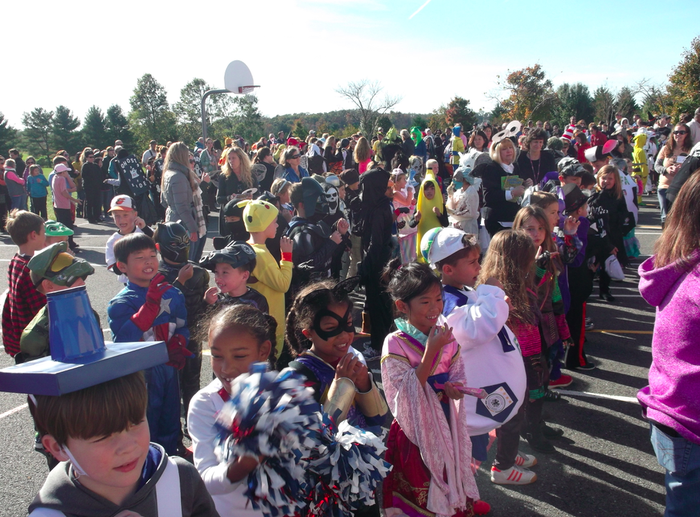 Our Halloween Parade will take place at 2:30 p.m. with classroom celebrations taking place directly afterwards. 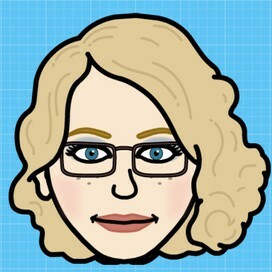 Our Team and Room Parents have already been in touch with teachers and teams to begin to plan! We will use the parade route that features all students coming out the front door, turning right and walking a route around the building to end at the playground blacktop. This has increased the opportunity for visitors to see the children along the route. 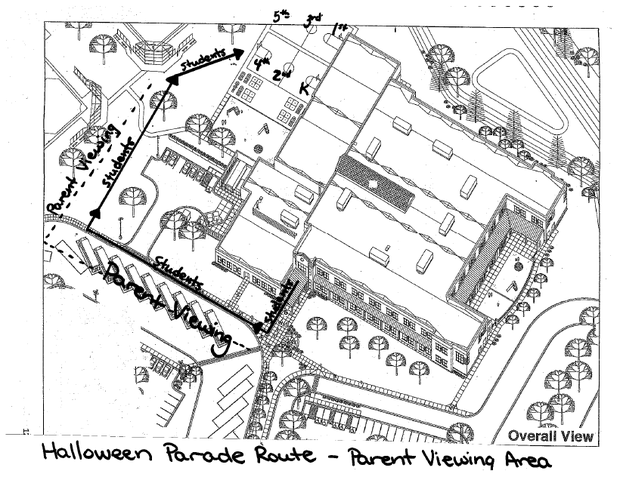 Our Halloween Parade Route has a designated route for students and a designated viewing area for parents. (See the map below) We will ask that parents remain along the viewing area to permit a safe and orderly journey along the parade route. 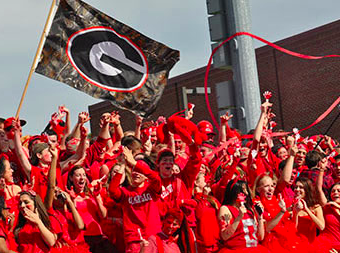 Once the parade is over, the students will gather on the blacktop. We invite parents to gather along the perimeter of the blacktop. Please do not stand against the wall along the school. That area will have our sound equipment and the teachers will need to move through that area. Please do not come into the classroom lines while the students are on the blacktop. We want to ensure student safety. While on the blacktop, the students will take part in singing Halloween songs that they have learned in vocal music classes. After this, all classes will go inside and begin their classroom celebrations. 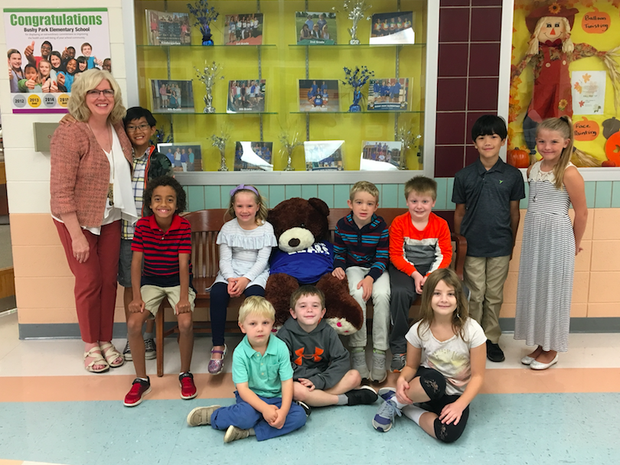 We invite the parents who are volunteering for their child’s classroom celebration to come in the building through the Front Office in order to sign in. Students are asked to bring their costume to school and not to wear it for the full day. 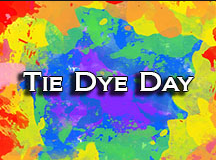 All students will have an opportunity to change into their costume before the parade. 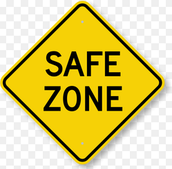 Staff members, not assigned to homerooms, will be available to help our younger students get ready. Thank you for supporting us in not having costumes that use weapons or are too scary. 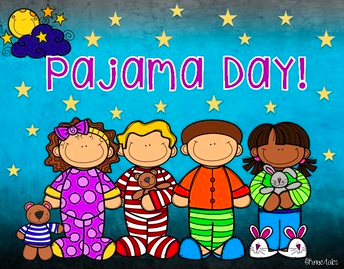 If you do not want your child to participate in the parade or any themed classroom activities, please send in a note to your child’s homeroom teacher no later than Friday, October 27th. 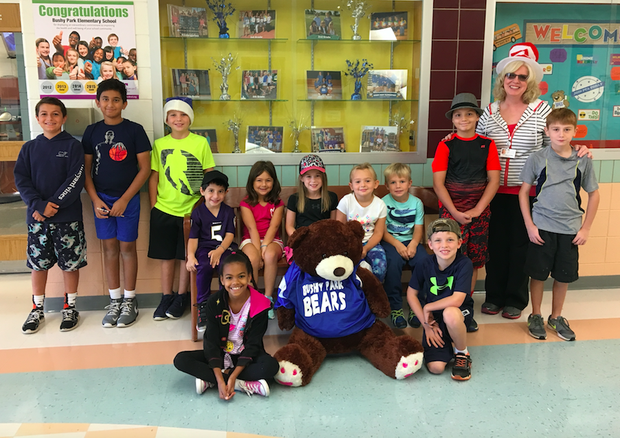 These students will attend an alternate activity in the Media Center. We need to know the number of students who will take part so we can plan accordingly. We appreciate your support and welcome you to join us for our Celebrations! 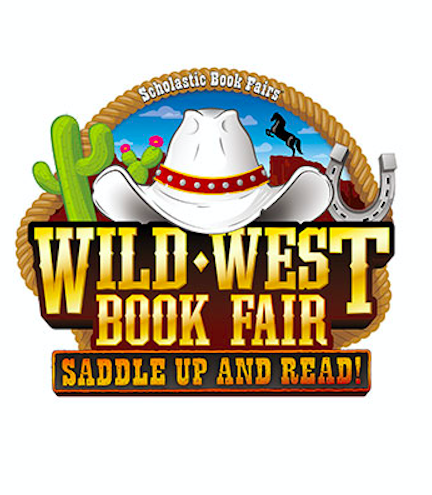 PTA Fall Book Fair Coming in November! 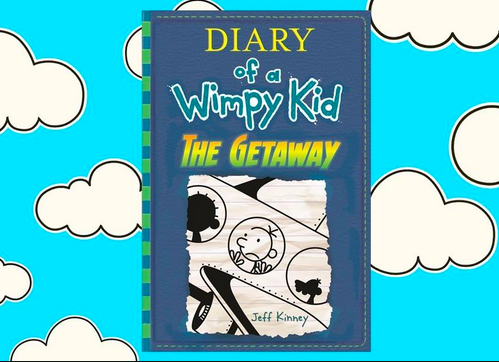 Diary of a Wimpy Kid: The Getaway will be available November 7, 2017. 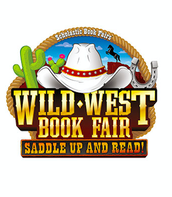 Our Scholastic Book Fair is offering a specially priced paperback edition of Diary of a Wimpy Kid: The Getaway for 8.99 plus tax. 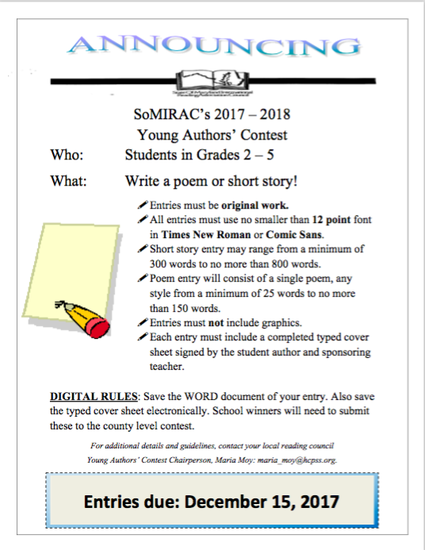 Contact Stacie Morris at staciecm@gmail.com for more information. Please place your order by October 31, 2017. We are looking for volunteers who would be willing to respond to requests from math teachers to work with a small group of 3-5 students. The students would work with a parent for 2-3 days a week for 4-6 weeks. 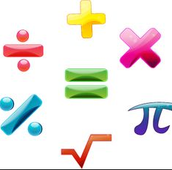 The parent(s) would be supported with resources and coaching from our Math Support Teacher, Joan Tellish. 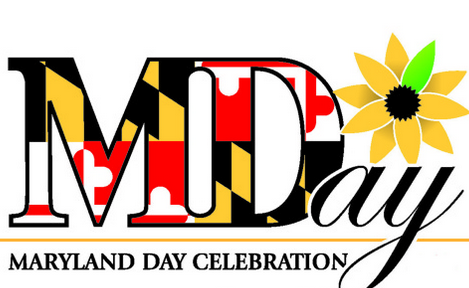 Please email Mrs. Ketterer at molly_ketterer@hcpss.org. 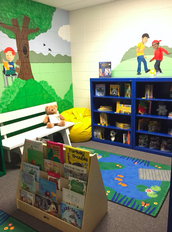 Sign up now to volunteer in the Carson Reading Room! Please see the PowerPoint on our school website to learn more about this fabulous opportunity to work with children and facilitate a love for reading. If you are signing up for your child's class, please consider also signing up for the classes before and/or after their class. The sessions are only 25 minutes long so if you are able to come earlier or stay later for another grade, please sign up for as many as you wish! In some cases, there are last minute scheduling conflicts that arise. Mrs. Husain and I will do our best to contact you to let you know if we need to cancel your volunteer time. If you need to cancel a sign up, please cancel on the sign up site in addition to contacting Mrs. Husain at hsabera@gmail.com, the teacher(s), and me. 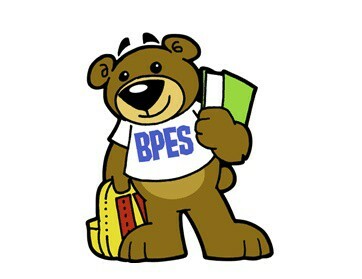 Lastly, please make sure you have completed the volunteer trainings for HCPSS and BPES before coming to the Carson Room. 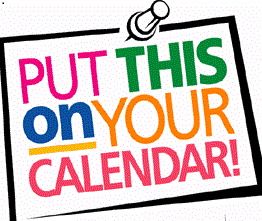 Please email Laura_M_Smith@hcpss.org or Sabera Husain hsabera@gmail.com with any questions." 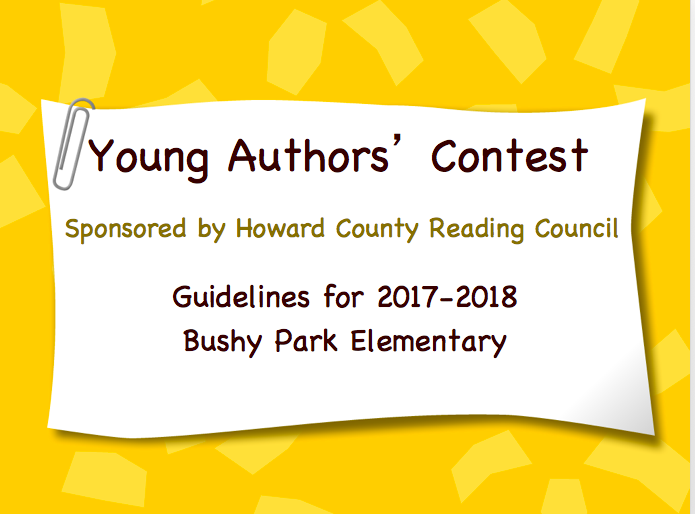 Mrs. Laura Smith, BPES reading specialist, is excited to share the opportunity of all young authors to showcase their best story or poem! 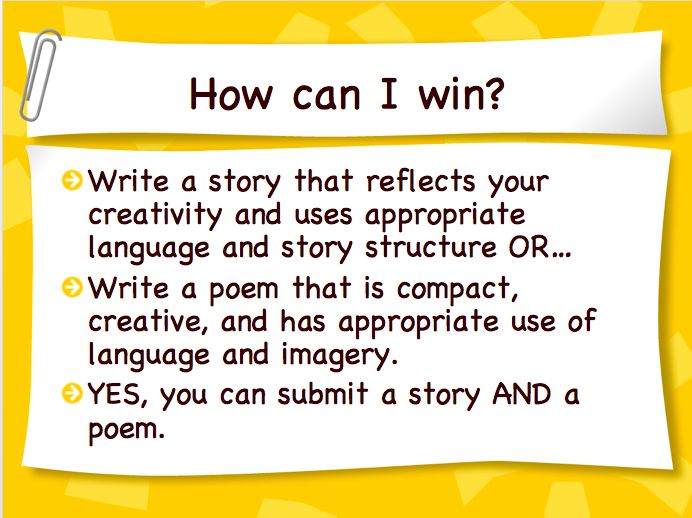 The powerpoint slides above are part of a presentation teachers will give to their students. 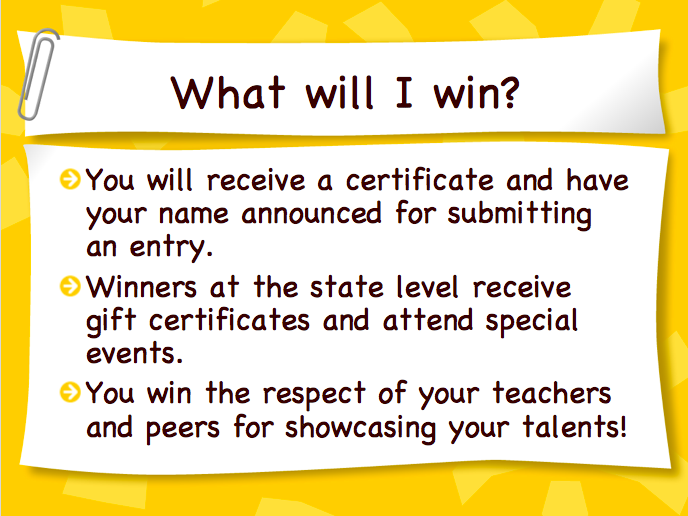 Help us spread the joy at home by encouraging your students to participate! See the Information below! 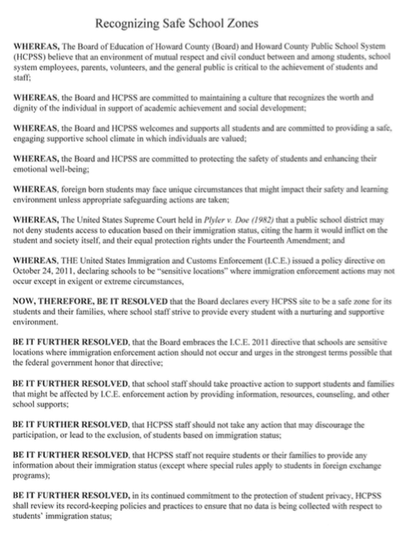 At the September 8 Board of Education meeting the Board of Education approved a resolution to support and protect the rights of all Howard County Public School System (HCPSS) students, regardless of immigration or citizenship status. One aspect of the resolution is that it needs to be posted at all schools and shared using usual means of communication. Howard County Public School System Interim Superintendent Dr. Michael J. Martirano presented his recommendations to relieve overcrowding in elementary and high schools, open new Elementary School #42 and align feeder patterns in middle schools at a meeting with the Board of Education on Tuesday, October 3, 2017. The proposal takes into consideration the 2017 Feasibility Study, two plans submitted by the Attendance Area Committee and input received from the community, and offers innovative solutions that combine programmatic expansion with redistricting to reduce overcapacity and address feeder pattern inconsistencies. 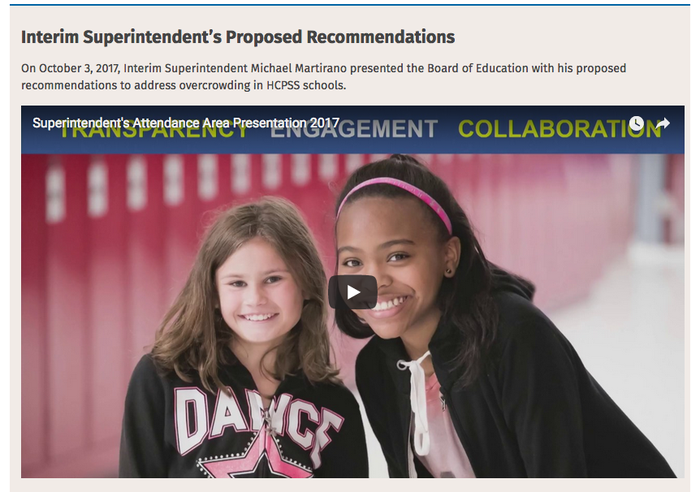 More information, including the report given to the Board of Education and a one-page document that details the recommendations, is available on the HCPSS website at http://www.hcpss.org/school-planning. Below, you will find a list of important dates over the next two months after the Superintendent makes his recommendations to the Board of Education. 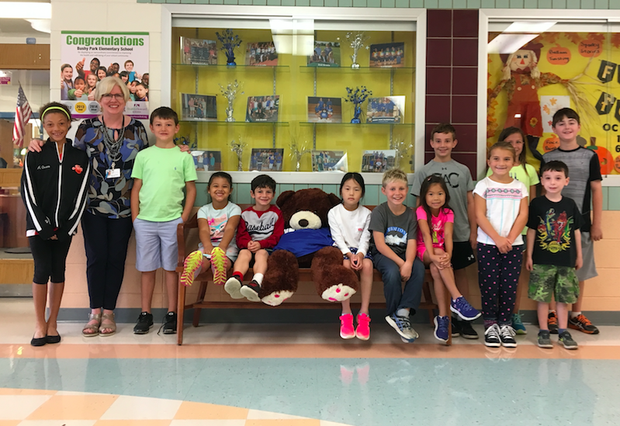 Please look for information in future editions of the Bushy Bear Tales related to the implications of redistricting on Bushy Park Elementary. 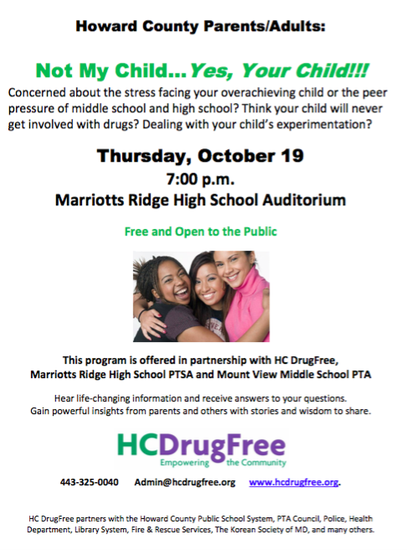 HC DrugFree’s program, “Not My Child…Yes, Your Child” presented in partnership with Marriotts Ridge High School PTSA and Mount View Middle School PTA will be held on Thursday, October 19 at 7:00 pm in the Marriotts Ridge High School auditorium. This event is free and open to high/middle school parents, family members and any adults working with teens who think their children will never get involved with drugs and those who are already suspicious or dealing with a child’s experimentation! 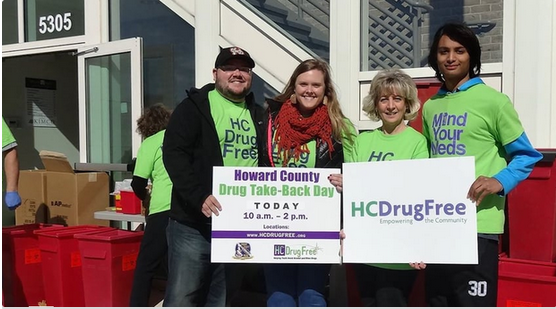 Hear facts, strategies, experiences and encouragement and get your questions answered by HC DrugFree and its community partners, as well as parents and others with stories to share. 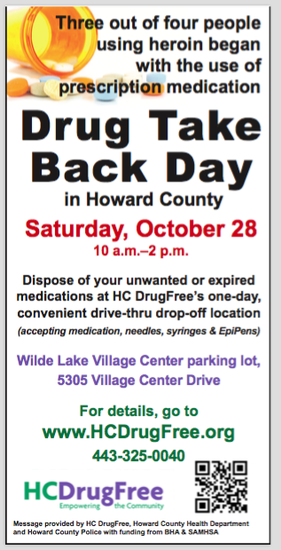 For more information and to understand the importance of attending this event, view HC DrugFree’s video at https://vimeo.com/231604408 and contact HC DrugFree at 443-325-0040, Admin@hcdrugfree.org, or visit www.hcdrugfree.org. 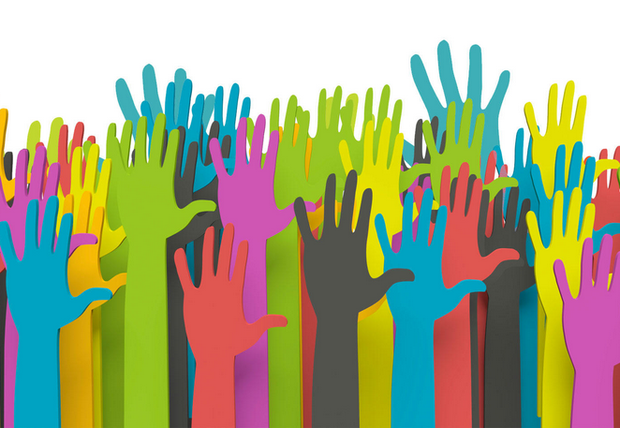 HC DrugFree Is Looking for Parent/Adult Volunteers, so whether you have an hour a month or 10 hours a week to volunteer, please email only to Admin@hcdrugfree.org to let us know your availability. Be sure to say if you can type, are willing to drive to pharmacies or liquor stores, and if you have any special skills or interests. 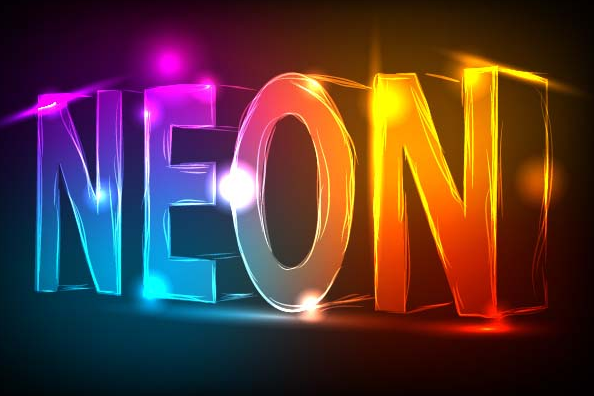 Each year, our own Leo Club inspires our Spirit Days for the year. 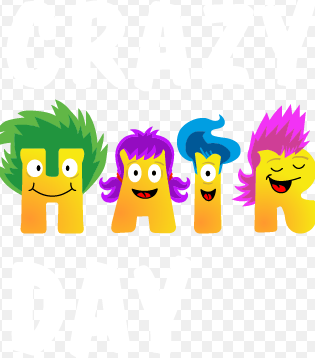 They help to create advertising to promote them and are usually the most creative in how they dress that day! 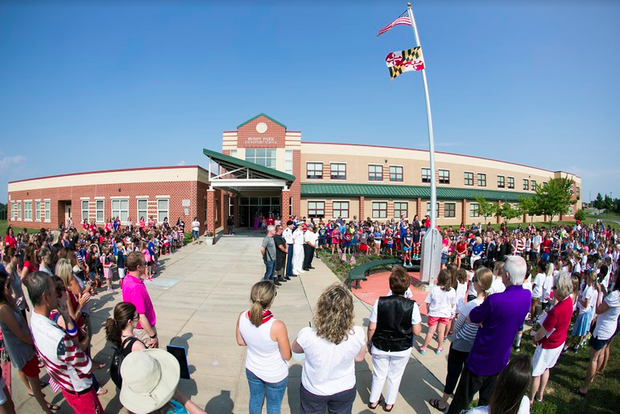 This link contains community notices which are neither sponsored nor endorsed by the Howard County Public School System.